Is your schedule too busy for you to attend one of our study groups? Would you like to study the topic of your choice privately? Choose your own topic or select from the following: Basic Jewish Concepts, Family Purity, Parshat HaShavua (The Weekly Torah Portion), The Biblical Importance of the Land of Israel, Women in TaNaCh, Women in Jewish Law, Prayer, Talmud, Tanach (Bible), Hebrew. 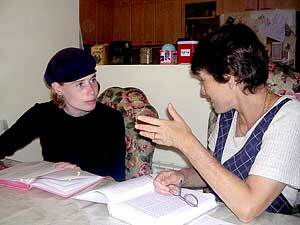 One on One Learning sessions are conducted throughout Jerusalem. Do you live too far from Jerusalem to study with us live? We would love to see you in Jerusalem but if you are too far away for now, consider studying with us via Skype. You choose the topic and the time! There is an hourly fee both the One on One and Long Distance Learning Programs.